Size: 65mm and 86mm decking boards. Clips are 550mm long, and come in packs of 20 clips. 4.2 clips per square metre are needed for simple rectangle shape, with joists at 450mm centres. For more complex shapes, or where joists are closer than 450mm, additional Clips will be required. If you are searching for decking clips in Victoria, SwiftDeck™ may have the answer for you! Our SwiftDeck Clip and decking board system simplifies the process of decking. The function of the patented SwiftDeck Clip is to allow the easy, accurate and fast installation of profiled timber decking, by locating the board quickly and easily. The SwiftDeck Clip is a perfect solution for those seeking decking clips in Victoria, as it speeds up and simplifies the process of laying down your timber deck, getting you to the beautiful result you desire even quicker. 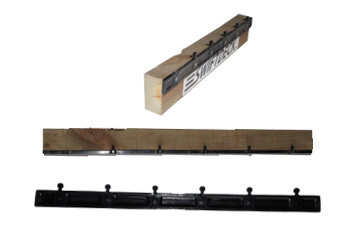 The function of the patented SwiftDeck Clip is to allow the easy and fast installation of timber decking, by locating the board and holding it with enough force to allow effective curing of the fixing adhesive.